Has Summer waited too long to return? 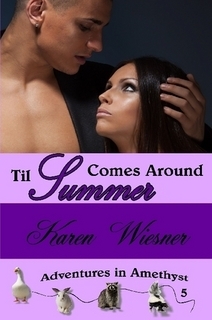 Summer is definitely not the type of woman to get caught up in a whirlwind romance. She is a very organized young woman with specific goals for her life. Her romance with Quinn caught her off guard. Unfortunately, Summer wasn’t ready to let her carefully laid plans be derailed. Little did she know how much her life was about to change. When Summer left, Quinn felt like a part of him died. It has been four years. Will Quinn still be waiting, or has Summer missed out on the love of a lifetime? Summer and Quinn have an amazingly intense connection given the short amount of time they spent together and the duration of their separation. Their love for each other is so strong that it compelled them to wait for each other. Quinn literally put his entire life on hold for years waiting for her to come back, and even though Summer continued with her schooling and professional goals, she clearly wasn’t truly living either. I understand why Summer is reluctant to return and confess what had happened immediately after she parted from Quinn, but I really can’t believe she didn’t try to contact him sooner as it is clear she never got over him. Summer finally decides to go back to Amethyst, but almost at exactly the same time as Quinn’s professional life hits a major snag that will require him to leave Amethyst. I was on pins and needles wondering if Summer would make it in to town before Quinn left. While the anticipation of their reunion really added a lot of suspense to the story, I do think it was drawn out a bit too much. I was nearly half way through the book before they actually met in person. However, I am pleased to report that they do indeed get together and their reunion is certainly memorable. Summer has some major trust issues that need to be resolved. She tells Quinn about her arrest almost immediately, but there are some other details that she is very reticent about sharing. While I understand that Summer thinks she is protecting him, I could see that postponing the inevitable would only make things worse. I knew it was only a matter of time before certain facts came to light. However, I wasn’t expecting them to be revealed in such a terrible way. Once the whole story came out, Quinn and Summer’s relationship is really put to the test. Will Summer finally trust Quinn completely? Overall, I enjoyed reading Til Summer Comes Around. Quinn is a wonderful, gentle hero and is a perfect match for Summer. I enjoyed watching them reconnect, and their happy ending is certainly well deserved. Fans of contemporary romance would do well to give this story a try.